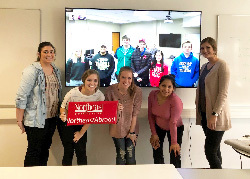 NORFOLK, NE – Students in Cara Hoehne’s International Business class at Northeast Community College have had the opportunity to get a glimpse of what working on a global scale beyond classroom walls truly means. Hoehne and Karen Spray, administrative professional instructor at Northeast, took five of the students to Denmark as part of a partnership with Aarhus Business College. “We had a very successful trip and look forward to future travels with our partners in Denmark,” Hoehne said. Northeast and Aarhus administrators signed a memorandum of understanding in 2013 to develop an academic cooperation and exchange program between the two institutions to promote relationships among students, faculty, administration and board members that will mutually benefit the colleges. The class, with Brith Jøker of Aarhus Business College serving as a co-instructor, began as a pilot course, that uses the latest technology to bring the Northeast and Aarhus classrooms together in real time. The class is in its second year of instruction. The first year, during the fall of 2017, was solely classroom instruction with no travel. However, this year saw the Northeast students traveling to Denmark and Germany. Northeast will host Jøker and her Aarhus students this fall. On this trip, the Northeast students had the opportunity to visit various classrooms at two different Aarhus Business College locations where they shared their experiences as young Nebraskans and Americans through presentations and conversations. Many students are continuing their relationship with their new friends through social media channels such as Snapchat, Facebook, and Twitter. The International Business course and travel opportunity will be available again as the course is now required in the Associate of Applied Business degree. International Business will be offered every fall with the travel experience every few years. Hoehne said the students will not be required to travel, but they will have the experience of working with someone through technology at Aarhus. In addition, they will be given a glimpse into what it would be like to work for an international company. Jøker sees this partnership with Northeast as a real opportunity for her students. The Northeast students who participated in the educational travel were sophomores Shanae Baker, Petersburg, Logan Connot, O’Neill, Hallee Held, Leigh, and Maria Lucas, Madison, originally from Guatamala, and freshman Chloe Bohuslavsky, Shelton. While the Northeast students experienced a different culture -- including different foods, modes of transportation, and languages -- Connot believes the Danish students learned a great deal from their interaction with Nebraska students, as well. She hopes the Danish students have gained a new perspective of what life in Nebraska and in America is like. Baker said the exchange to Denmark was a once-in-a-lifetime experience. Even the Northeast students in the class who did not travel to Denmark see its value. Other students in the class are Sophomores Megan Eucker, Madison; and Tate Tiedtke, Norfolk; and Freshman Christian Lopez, Spalding; Bo Painter, Ainsworth; and Taylor Roberts – Rising City. Hoehne said at the conclusion of the course, students will have a better understanding of what it takes to operate in the area of international business. Northeast Community College students enrolled in an international business class take a group photo at the same time as some class members were in their classroom in Norfolk (back row), while five others (front row) were in a classroom at Aarhus Business College in Aarhus, Denmark. Pictured in the front row (l-r) are Hallie Held, Leigh; Shanae Baker, Petersburg; Chloe Bohuslavsky, Shelton; Maria Lucas, Madison; and Logan Connot, O’Neill. Pictured in the back row (l-r) are Megan Eucker, Madison; Christian Lopez, Spalding; Bo Painter, Ainsworth; Tate Tiedtke, Norfolk; Sydney Quinn, Ainsworth; and Taylor Roberts – Rising City.